An interdepartmental project each semester brings together Brenau University students from three very different disciplines to practice handling one of the hardest things in life: death. 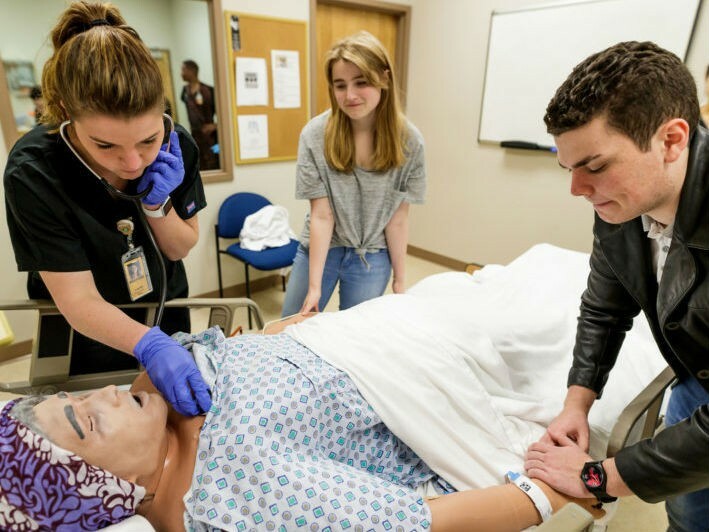 The Death and Dying Simulation, which ran for two days last week, involved Brenau nursing students, psychology students and theater students who work together to allow second-year nursing students practice handling family members of dying patients. The theater students play the role of the family members during the simulation, and psychology students work with the nurses afterward to identify any struggles they faced in the practice. The Mary Inez Grindle School of Nursing at Brenau has a nursing simulation laboratory, modeled after genuine hospital rooms and waiting rooms. The sim lab also boasts highly technical, medical simulation manikins, which can speak, blink and cry, as well as bleed, sweat and urinate. From a computer in the next room, Buffington can control the manikin’s vitals, include breathing and heart rate. In the first simulation Tuesday, University of North Georgia students Maggie Todd and Matt Lunsford, who are members of Gainesville Theatre Alliance, the theater partnership between Brenau and UNG, played a young woman and her estranged husband waiting at the deathbed of the woman’s grandmother. The estranged husband proved to be a disturbance in the hospital room, something the future nurses had to handle as they cared for their patient and her family member. Buffington said this is the fifth year the departments have teamed up on the project. Brenau nursing student Jessica Ray said she found working with the family members harder than the dying patient. In another scenario, Lunsford played Todd’s estranged husband. In another, the pair played equally devastated spouses, and Brenau nursing student Leidi Rodriguez turned off the vital signs monitor out of sensitivity to the family – a move her instructors say can be crucial in these situations. Rodriguez described the simulations as “pretty intense.” Buffington said the purpose of the scenes, no matter how serious or how seemingly ridiculous, is to illustrate all the possible human scenarios that truly do occur in the hospital rooms of dying patients.